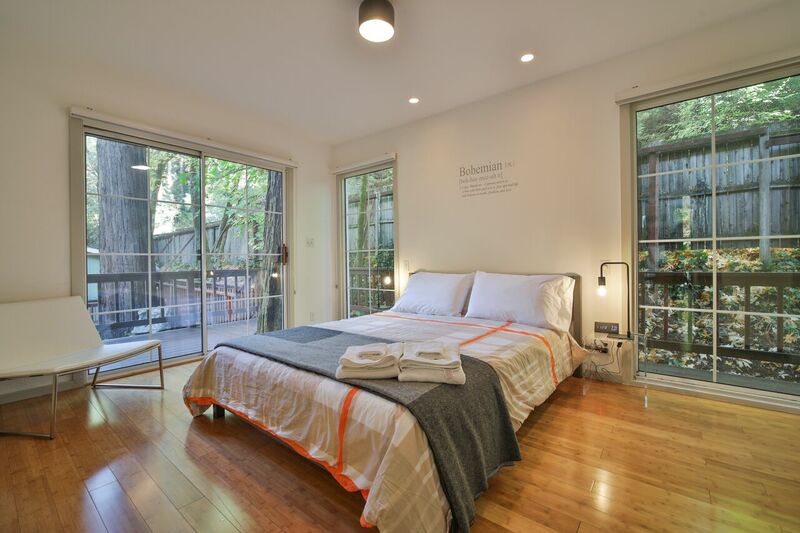 3 nights for 2 November through March, All Holidays Excluded! Boho Rhapsody is a STUNNINGLY designed, sweet creek-side sanctuary! 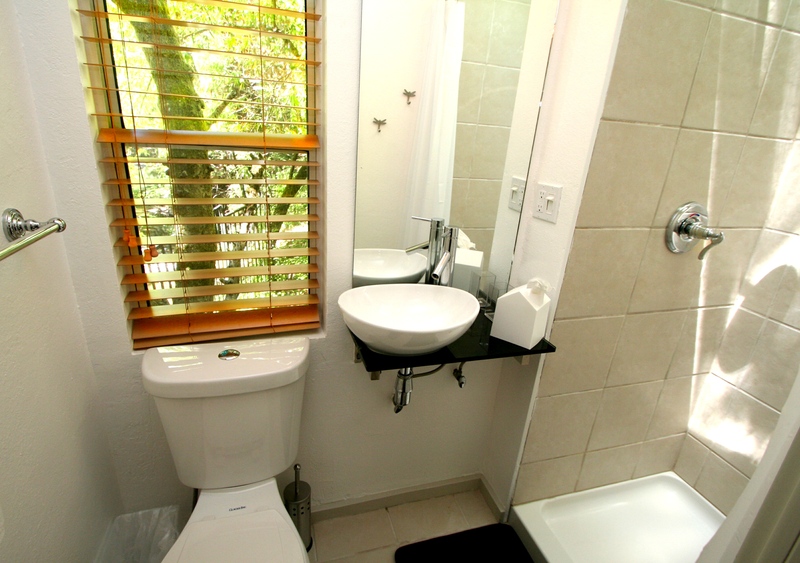 The cottages have a modern and clever design but are warm and homey at the same time. 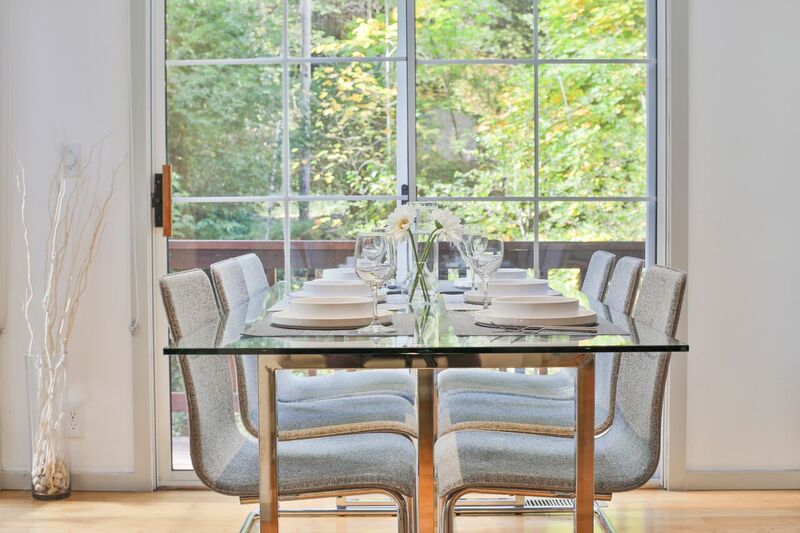 Invite the outdoors in with sliding glass doors! Bohemians are wanderers and adventurers loving music, the arts and literary pursuits. Boho Rhapsody invites you into its magical world. Get lost in your imagination with its openness. Inside, outside, sameside when you open all of the sliding glass doors. 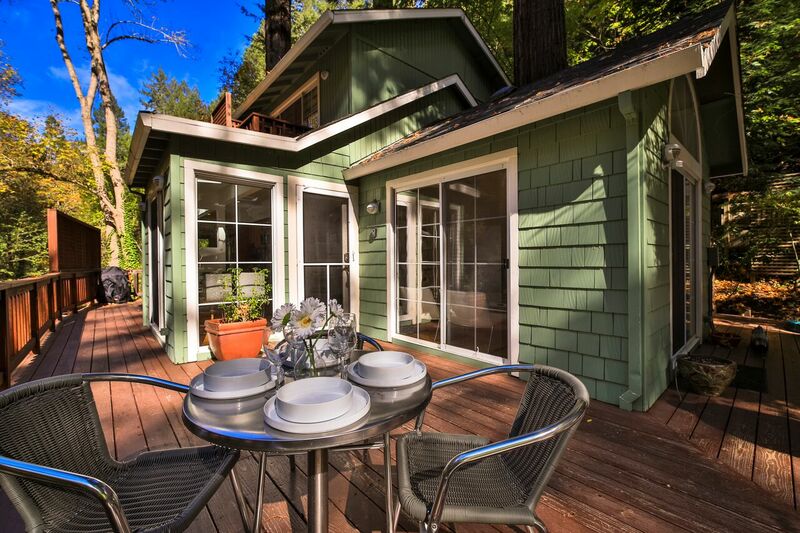 The larger cottage has 2 bedrooms, 1 bath, designer kitchen, dining area and an inviting living surrounded by the forest! 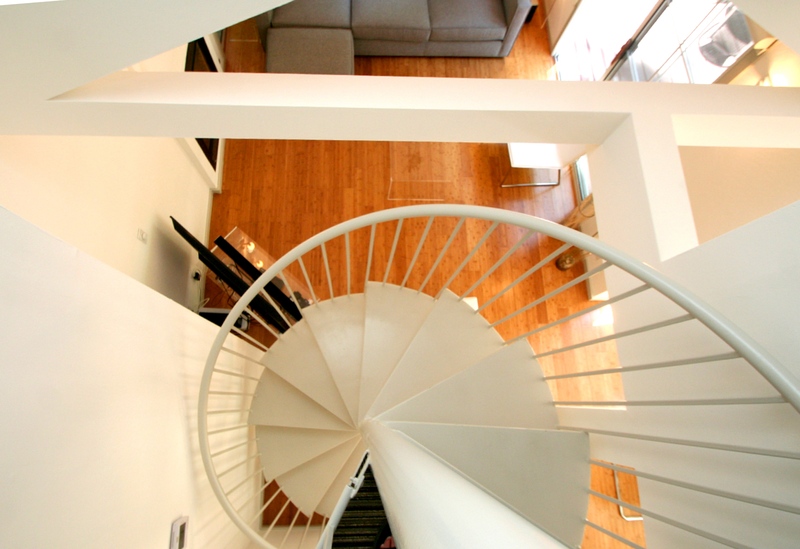 A spiral staircase takes you to the master bedroom with it's own veranda overlooking the creek. 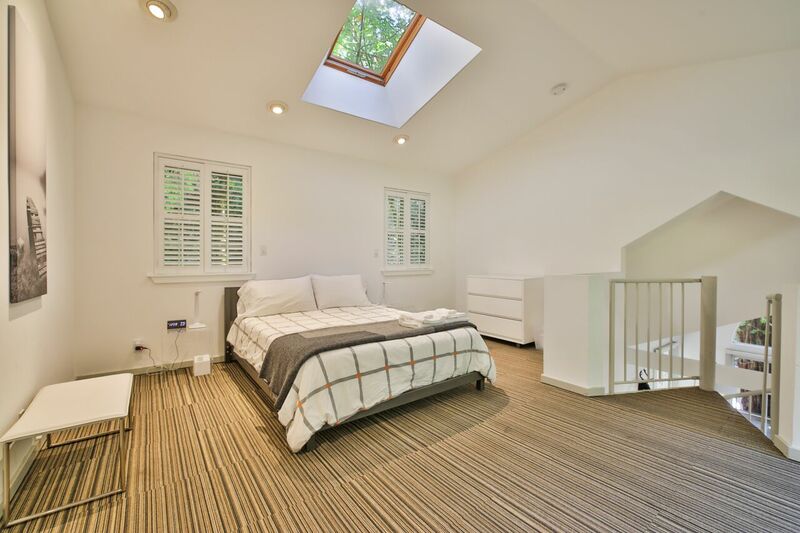 The skylight over the bed is a stunning way to wake-up. 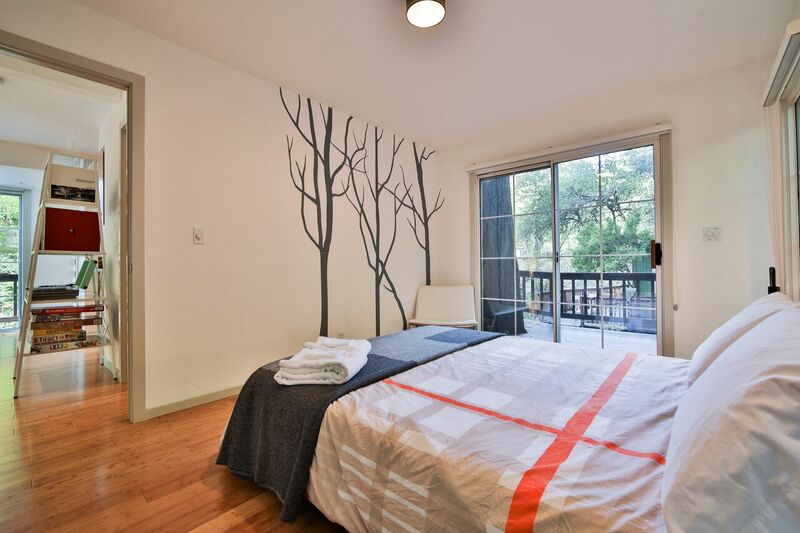 The downstairs bedroom has a sliding glass door and a wood deck that leads to the second cottage. 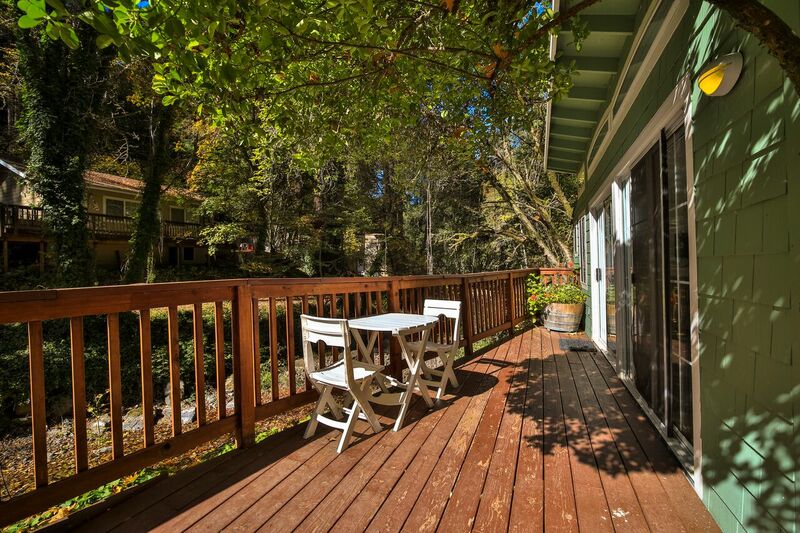 The wrap around deck opens to all rooms and offers both sunny and shady areas to relax in. 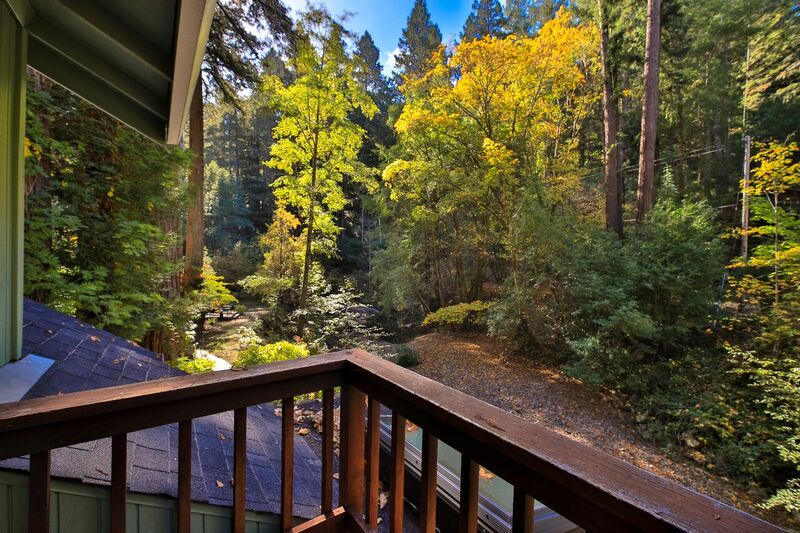 The Hot tub is located under towering redwoods and is the perfect place for you to relax and rejuvenate. 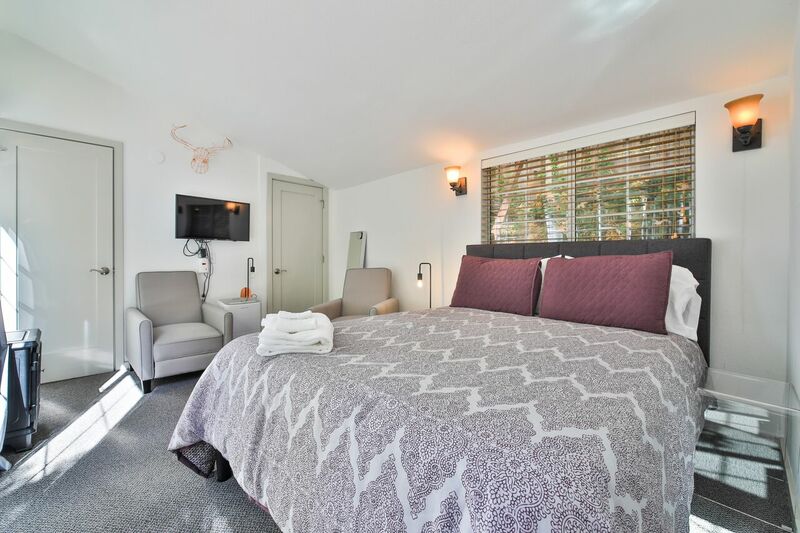 The small cottage offers a sweet space with a queen bed, flat screen tv, kitchenette and bathroom. The entire property lines the creek which has a seasonal swimming hole. Keep an eye out for Salmon as they venture upstream. 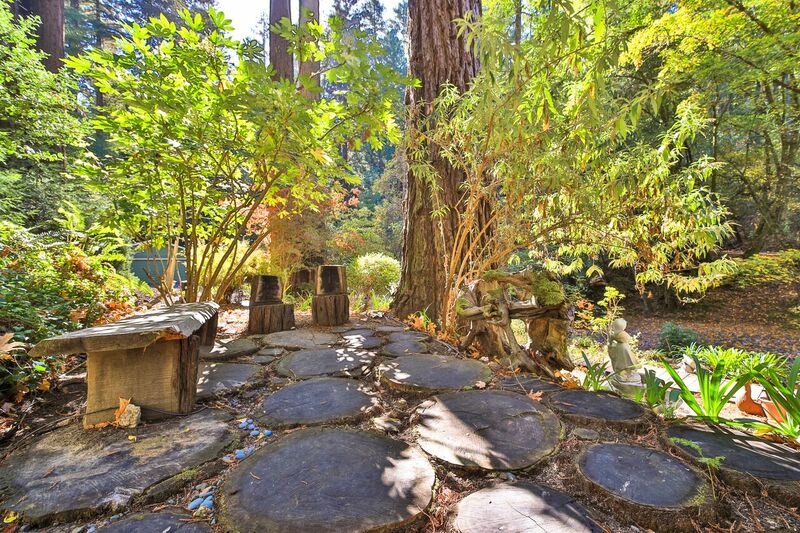 A myriad of paths lead to different sitting a gazebo surrounded by redwoods. Boho Rhapsody is in the Wine Country close to the Russian River, Jenner, Monte Rio and Occidental. It is the perfect place to land for your vacation and is certain to be the place you will return to time and again.. Friendly reminder: 6 people max and 3 cars max day or night. 3 cars max. Quiet hours 9:30 - 7am to be observed by all guests. 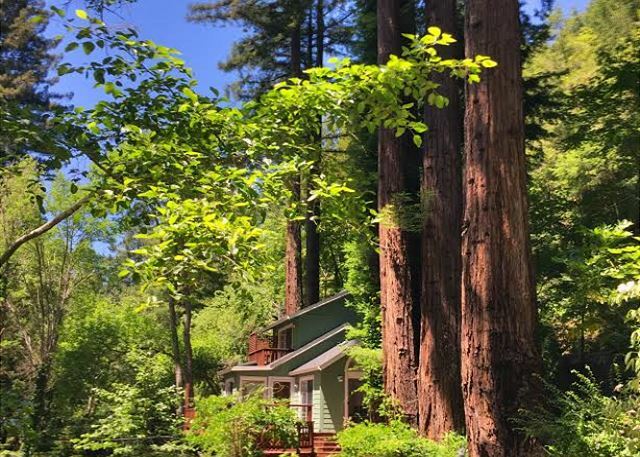 Very sweet, peaceful, clean, and nicely laid out vacation home right in the middle of the redwoods, on a cute creak, and not too far from Russian River. Highly recommend! Our family had a wonderful stay at Boho Rhapsody. Super cute on a little creek, tranquil! Lovely house in a great location. 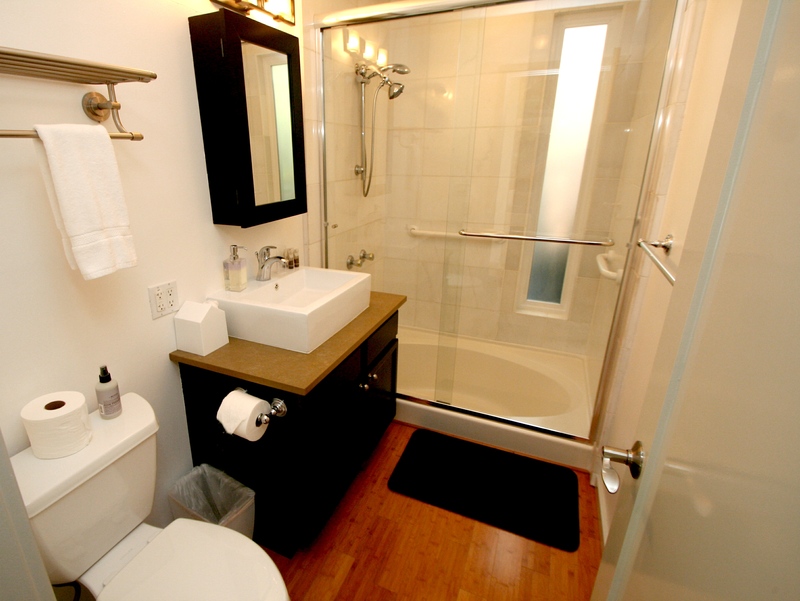 The house is really clean and tidy and has everything you need. The stream is right outside the house! Beautiful peaceful place. My friends and I had a fantastic visit at the Boho Rhapsody. Unfortunately there was a heatwave happening in the Bay Area so we couldn't make use of the hot tub but everything else was wonderful. Manager response on 2017-09-25 - Response from Dillon Beach Property Management, Inc.
We loved this cottage and didn't want to go anywhere during out stay! It has everything you need and the setting is so idylic. The only issue is road noise. Enjoyed playing in the creek with the dog and sitting on the deck with a book. We would stay here again. because it's amazing. 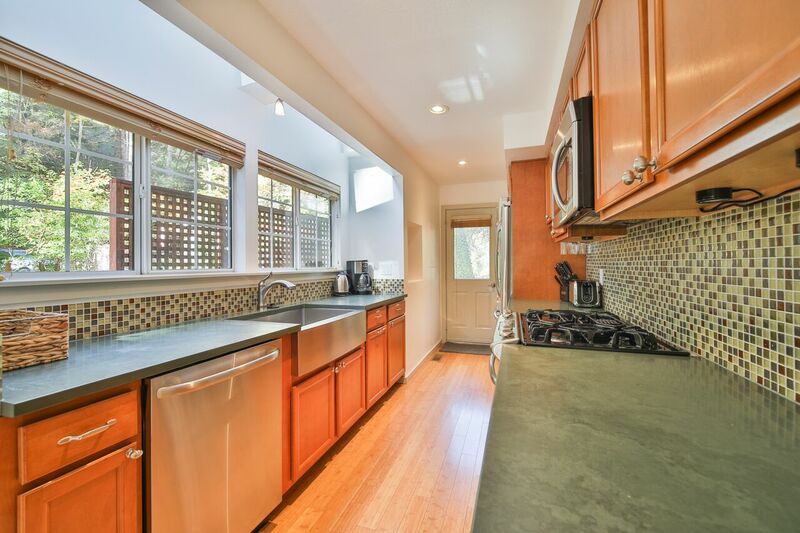 Manager response on 2018-04-04 - Response from Dillon Beach Property Management, Inc.
House was beautiful and clean. Nice touch with the vinyl records and player. I think off street parking should be made available at this property. Space is available but locked. It was a bit dangerous unloading luggage on the side of a curvy road. Manager response on 2016-07-29 - Response from Dillon Beach Property Management, Inc.
a short drive to golf course . Great Time ! We stayed at Boho Rhapsody with my in-laws, our 12-year old son, and my aunt. The place was gorgeous, the setting was incredible. All the little towns nearby were adorable. We did an amazing bike ride that took us through redwood forests, to rolling ranch lands, to the rugged pacific, and up a grueling hill to a plateau from which you could see the ocean and the sierras. Manager response on 2016-10-12 - Response from Dillon Beach Property Management, Inc. Reserved this great house for my birthday weekend and it was hard to leave it to go anywhere else. We literally had to be riled up to get going to even visit a winery (and we love wines) to leave. It was such a relaxing place, well stocked, organized, clean. 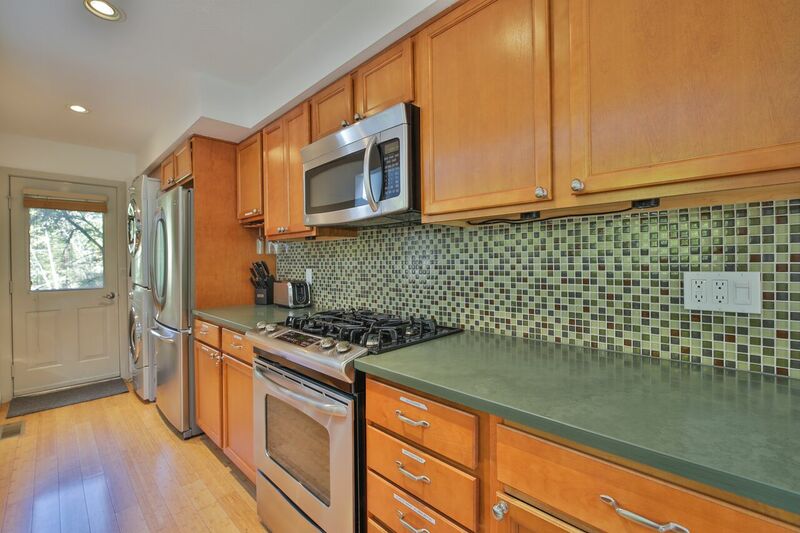 The Property Management team was responsive, accommodating and efficient. Being surrounded with redwoods and the creek was just heavenly. Can't wait to come back again! Manager response on 2017-05-10 - Response from Dillon Beach Property Management, Inc.
Beautiful house. Well kept, very clean. Awesome grounds and views. Loved the separate quarters for my son. Great location. Only thing I would have liked is more pillows!! Manager response on 2017-04-01 - Response from Dillon Beach Property Management, Inc.
As soon as we walked in, I knew it was the right spot. We have always stayed right on the river before, and we were a little nervous about selecting a creek side property. But it turned out to be perfect for us. The creek was shady, which made it the perfect place to hang out in the 100 degree weather we had there. There was a small but serviceable swimming hole, more privacy than we usually get on the river (where people are floating and paddling by all day), and the magic of being next to a little babbling brook. It felt a little like a fairy tail home. 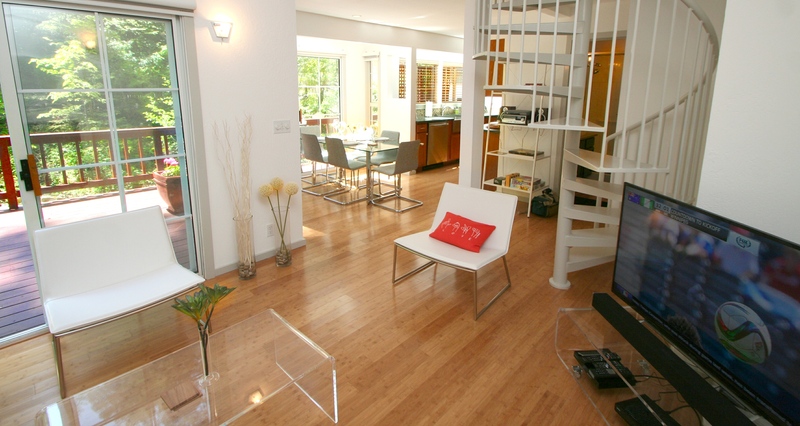 The house itself is mall but beautifully decorated with modern furniture and very comfortable. We cooked for most of our meals and found everything we needed in the kitchen. The beds were comfortable. There was a nice selection of family board games to play. And when we did want the more submersivebriver swimming experience, we just drove 5-10 minutes down the road to Monte Rio and used the wide public beach. We loved Boho Rhapsody! Manager response on 2017-06-22 - Response from Dillon Beach Property Management, Inc.
i stayed for two nights in July with my kids. 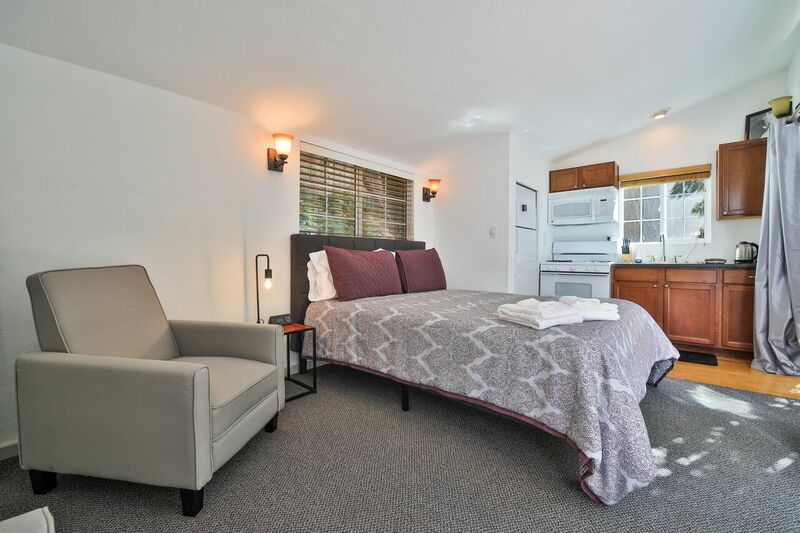 The place was comfortable and clean, and close to the activities of the Russian River. Sadly, the creek outside is dried up (blame the drought), but we still enjoyed our stay and would recommend it to others. Manager response on 2015-08-07 - Response from Dillon Beach Property Management, Inc.
Beautiful property down a winding wooded road. Sits along a creek (although the creek is dry right now due to the lack of rain in CA) on a wooded lot. 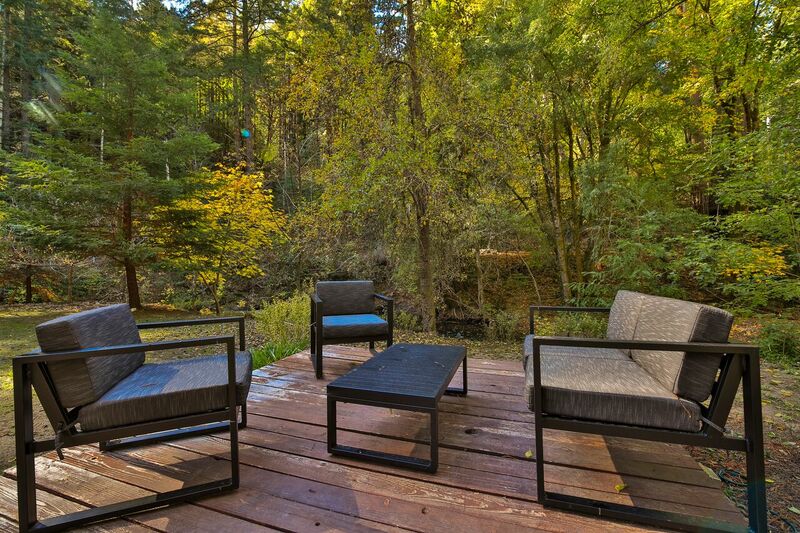 If you are looking for nature and relaxation this rental is perfect. 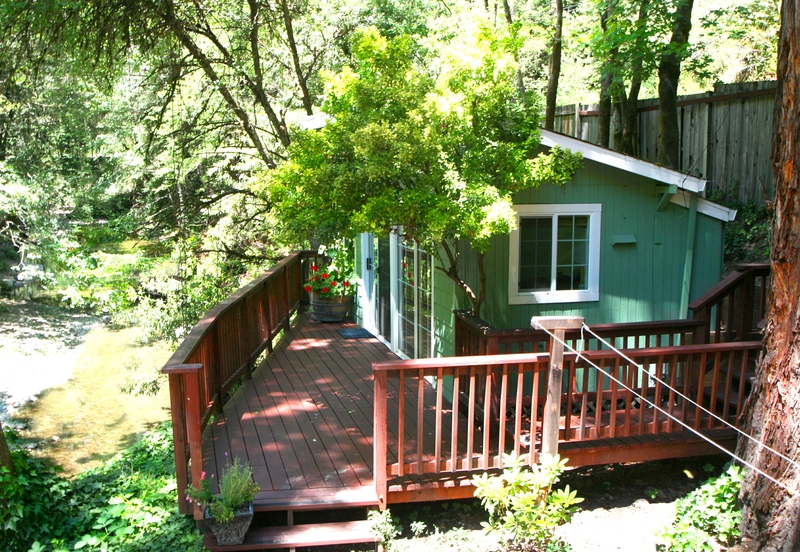 Close to wine country but private and relaxing. We would rent this home again if we visit the area on vacation. 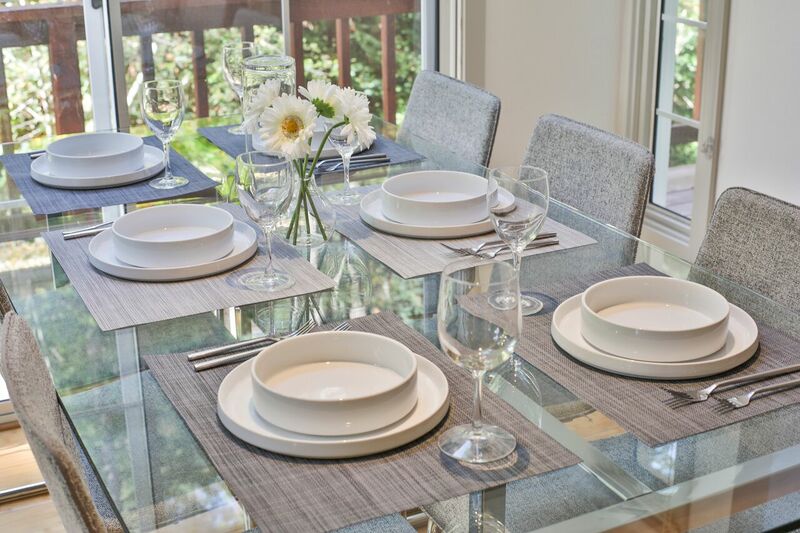 The home was clean and well maintained, the rental company easy to work with and very responsive. No hidden fees or costs that weren't disclosed up front. 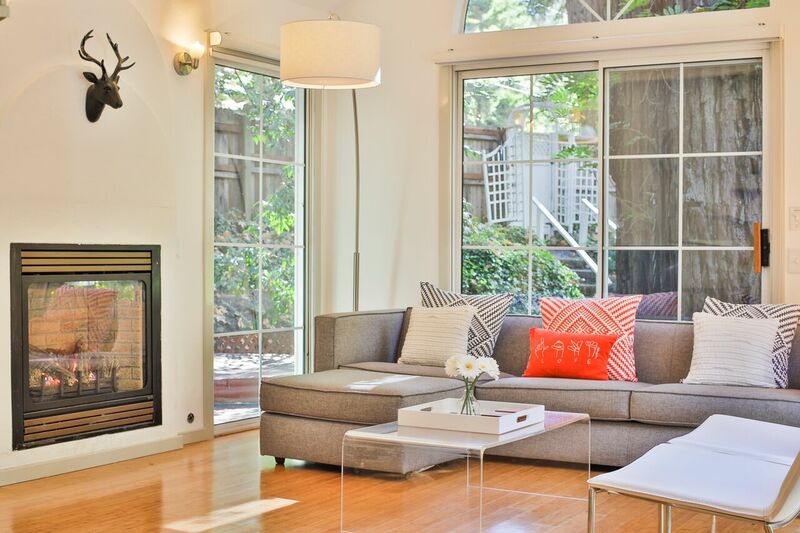 We highly recommend this rental. Manager response on 2015-09-10 - Response from Dillon Beach Property Management, Inc.
We loved our stay at this house. The setting is wonderful, and the house is very nicely decorated. Before we left we booked another stay over Labor Day weekend. 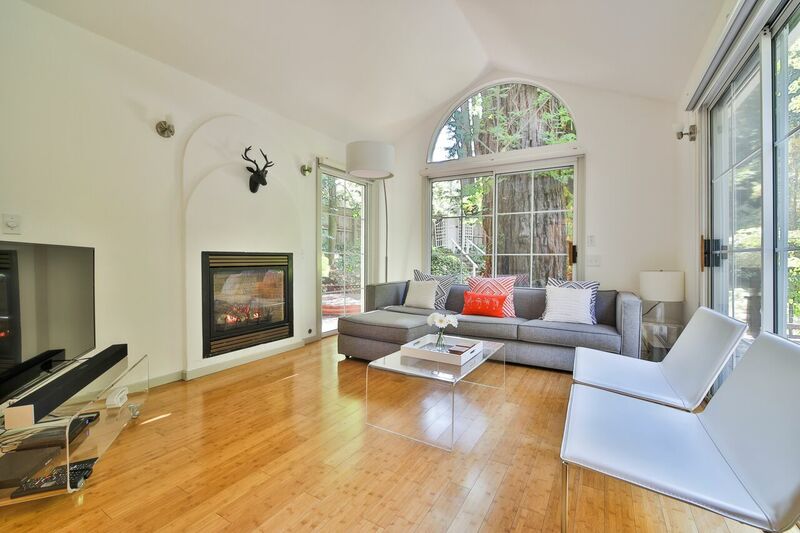 Manager response on 2016-04-06 - Response from Dillon Beach Property Management, Inc.
Of course, a spot in the redwoods along the Russian River is a great spot. Yet this place was really special. 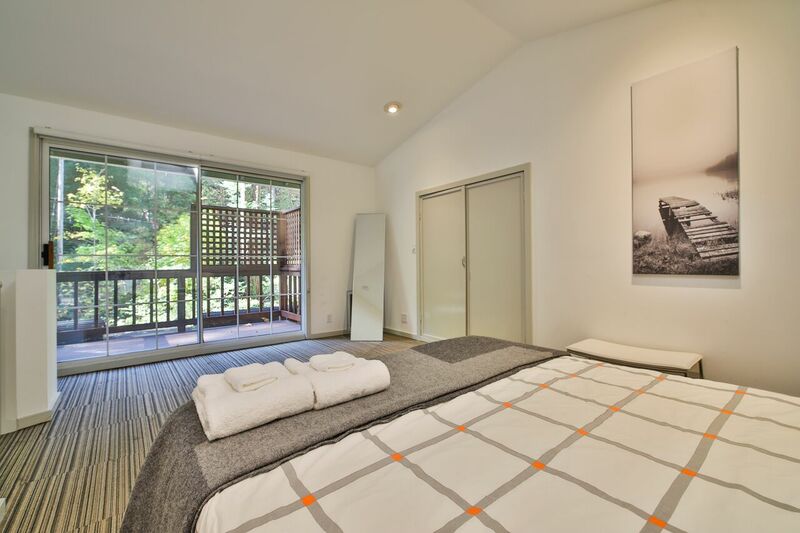 House was classy, contemporary and impeccable, nestled perfectly within the trees. Will definitely stay again. Glad you had a wonderful time at is really something special. We look forward to your next visit! thanks, stace russian river escapes. Glad you had a wonderful time at is really something special. We look forward to your next visit! thanks, stace russianriverescapes.